The Student Support Services Program recently celebrated the hard work and dedication of 85 students who have excelled in the face of adversity and significant obstacles. 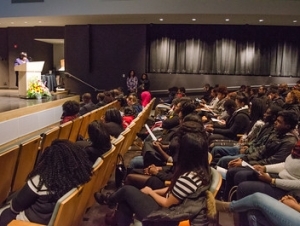 The program, informally known as SSSP, held its 23rd annual Student Recognition Ceremony on Thursday, February 5, in the Burchfield Penney Art Center's Peter and Elizabeth C. Tower Auditorium. 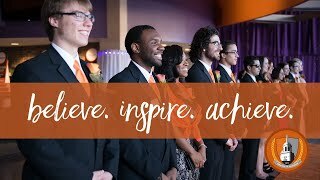 Buffalo State administrators, faculty and staff, and invited guests celebrated the academic achievement of students carrying a cumulative grade point average of 3.0 or higher. SSSP ensures that first-generation, low-income students, and students with disabilities are able to get the assistance they need. The 27-year-old program has encountered its own challenges of late, including the loss of critical federal funding. A bolstering $50,000 grant from the First Niagara Foundation helped ensure that this important initiative could continue for another year. “We are so appreciative to the college for its collaboration with First Niagara Bank and to First Niagara President and CEO Gary Crosby for helping us get through this year,” said Florence Johnson, director of SSSP. "Our motto is, 'My destiny will happen because of me.' You are helping us fulfill that motto." In addition to advisement, counseling, and training, SSSP provides opportunities for academic achievement, cultural enrichment, and tutorial assistance, while motivating students toward successful completion of their degrees. Alumna Jenna Tomasello, ‘13, recalled how SSSP advisers guided her from undeclared status to a major in philosophy. Tomasello was eventually awarded “outstanding major in philosophy” and was published in an undergraduate philosophy journal during her senior year. She attended graduate school at the University of Rochester and is currently a program associate for the American Youth Policy Forum. “I made the most out my experience and was able to accomplish many things that I never thought possible,” she said. Each year, SSSP accepts approximately 50 students who are living in poverty or face other barriers to college. The retention rate for these students has typically exceeded the college as a whole, with at least 90 percent remain in good academic standing. University College Dean Scott Johnson encouraged the assembled students to reflect not only on their own achievements, but also on the opportunities that helped make it possible. View list of students recognized at the SSSP ceremony.